Pinoy Pop Culture: Interesting Notes on "Mistah"
Four brothers belonging to the famous Padilla clan in Philippine show business starred in this film: Robin, Rustom, Rommel, and Royette. Fast forward to 2012, Robin is scheduled to star in a series for ABS-CBN. He is also part of the sitcom Toda Max for the network. Rustom is now known as Bebe Gandanghari after coming out in 2006. Rommel is the father of rising young actor Daniel Padilla. 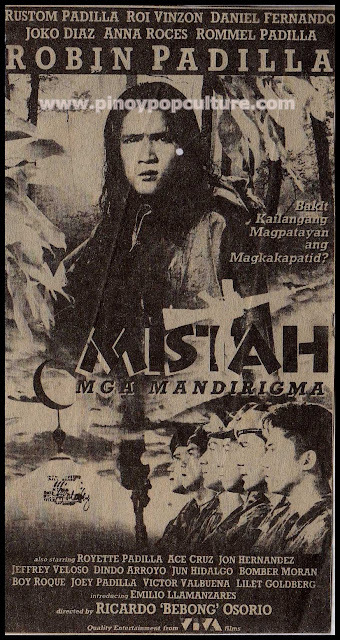 Other actors in Mistah include Roy Vinzon, Joko Diaz, and Daniel Fernando, who is vice-governor of Bulacan province since 2010. The poster might have a prescient nature. It can be seen that Daniel Fernando's name is placed above Rommel Padilla's. Omit the 'Fernando' and the 'Rommel' and 'Daniel Padilla' will remain.